My first surprise was when I opened the code, besides the creation of the canvas, the rest look all cryptic. Seems mostly giberish, really hard to understand anything due to some kind of ofuscation done to hide and reduce the code. So I need to deofuscate it if I want to read it. The first thing I noticed is that most of the code is stored in a string var called underscore, and at the end he does some transformations to that string and pass the result to the eval function to execute it. This way the code can be ofuscated in extreme ways, replacing chuncks of character with special UTF8 characters that will be expanded later. Interesing but hard to read. The code probably was optimized by the Closure Compiler so in order to read it you have to expend a lot of time cleaning it. I had to play for an hour to understand most of it, and all I can say is that the approach is very neat, I will try to explained chunk by chunk. First he puts the bgcolor of the website to black and initializes lots of vars to 0. Then launches a setInterval to call his rendering function every 35 ms. The rendering function consist in generating 1400 layers of data (stored in T), every layer is a slice in XY of the scene containing what I call a “rectangle’s cloud”, which is an array of rectangles spread on that XY plane. Every layer has a different Z so when rendered from far to near, it gives a nice depth impression similar to a point cloud rendering. The layers are not rendered to independent canvas, they are just stored on an array called p with all the rectangles info. The info stored per rectangle is [x, brightness, width, y, height]. 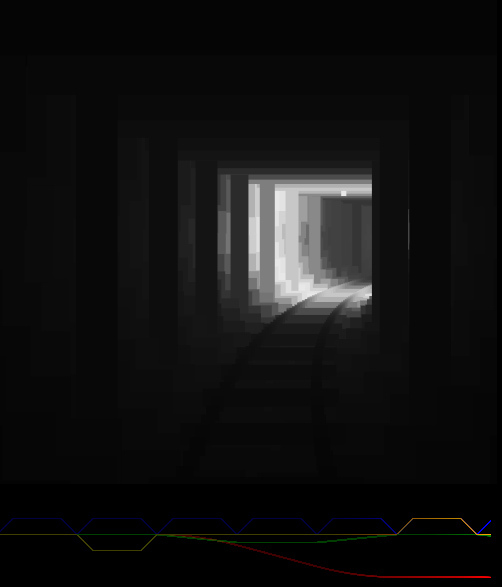 Now it computes several factors that will be used to define the area in which the minecart is passing by (bridge, tunnel, slope, etc), encoding them in several factors. Sadly most of the equations had been very ofuscated (probably due to the optimizations of Closure) so I will have to wait till Philippe releases his own explanation of the code. Now it gets the current layer array from T, initialized it with info about the X and Y offset of the layer used to do the curves, slopes and camera movements. It also stores info about a brightness modulation for the layer. This is later used to fake the ilumination by brightening the layers close to the lights. The algorithm to fill the layers is split in several parts, every part fills some information about the layer (rails, cave, light bulbs, etc), but they are spread in different steps, which gives a better sense of depth without having to fill every single layer. Check the use of “i % something”. 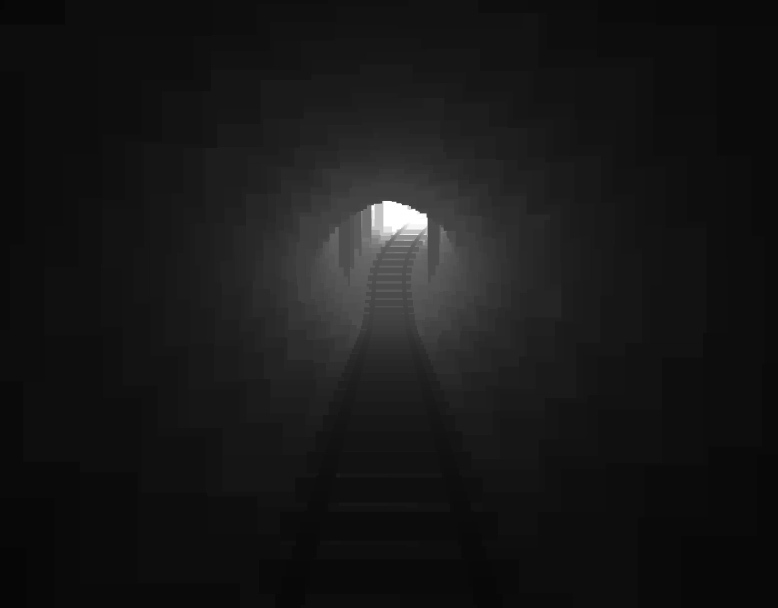 And then the rails (they are separated because to give a better feeling of continuity the rails are rendered every 5 layers instead of 10 as the cave. Once we have all the layers needed, we do the rendering pass. This part has lots of mathmatics to do the perspective projection, the camera movements, etc. It renders the layers in front of the camera as a set of rectangles until certain distance, from far to near. And finally the delta time, that increases the speed using different intervals to give the sensation of climbing or descending. red = X of path, green: yaw rotation, blue: window to modulate transitions between areas, orange: delta Y of the rails. It is interesting to see how simple formulas can add to create smooth transitions. There are still lots of tricks I have to investigate but overall all I can say is that I wish one day I can do something so neat as this. Congratulations to Philippe, you inspired me to work harder. Nice analysis, a good inspiration for livecoding! Awesome post. I was waiting for this. Thank you for taking the time to explain how this works, it always boggles my mind when I see something so cool come out of a small amount of code. I was wondering how something so complex could come from such a small amount of code, and I think the best way to describe it is using all available code shortening techniques combined with clever use of the eval() function.